The influence of the artist who restored La Granja is shown by stunning terraces framed by eucalyptus trees and the original Canarian external staircase. Internally there is a music system,TV, a selection of videos, a library and a games table. The main house is a spacious 3,000 square feet with high beamed ceilings in the entrance hall, sitting room and dining room. The three bedrooms each have a modern en-suite bathroom. The walled pool area has multiple tables and a pergola ideal for shaded dining. Each bathroom in the main house is fully tiled in white ceramic tiles and the bathroom units were all supplied by Roca with marble or Corian tops. All the floors are tiled and every bathroom has matching towels. Hot water is supplied by three independent electrically heated tanks. One of the tanks serves both bathrooms downstairs in the main house. Each kitchen has its own independent electrically heated tank for hot water. The current TV available is Spanish digital. There is the ability to switch the language into English (in most cases) if it was originally in English. The master bedroom has access to a traditional canarian balcony. There are numerous reliable companies where a large variety of bikes can be rented. Please do ask me before booking if you would like me to book bikes for all or some of your holidays. There are numerous companies on the island that provide daily excursions in addition there are many boats available for fishing trip hire. There are two good courses on the Island. The games room is separate from the main house and cottage. It has a pool table and dart board. The room has double doors, opening windows and roof lights which allow in natural light. Originally a studio, the room also has easels and sculpture stands. Art materials are available in Arrecife. There is a permanent chess table in the dining room of the main house. We have stayed in the Canary Islands a number of times over the years but never in a Finca and La Granja was for us like stepping back in time. It is a marvelous very large old property with furniture and decor to match so much so that the 42inch TV looked somewhat out of place but it was very welcome with all of the BBC, ITV and Sky channels. The owner Paul is a very laid back knowledgeable chap with many years experience of Lanzarote and he will answer any queries you have about the island. As my wife and I love our morning cuppa it was great to have a proper teapot, so many of our previous holiday bookings didn't. As La Granja is in a rural area in the middle of the island it would be beneficial to hire a car for your stay, but the number 32 bus passes La Granja quite regularly. If you are an animal lover you will be over the moon to meet Lenny he is a Portuguese Water Dog with a curly black coat, he is so friendly and always pleased to see you, we fell in love with him and were very sad to leave. For our stay we slept in the room adjoining the pool with ensuite shower and toilet facilities the bed also is huge and extremely comfortable. All in all we had a very peaceful and comfortable holiday, we will be back again Paul I'm sure health and finances permitting. We loved our stay at Paul's place. He was the perfect host, always on hand for a friendly chat, help or advice, but never intrusive. The house was wonderful, so much grander than any other holiday accommodation we have stayed in, but still comfortable and cosy with lots of personal touches. It's slightly bohemian, filled wonderful art, antiques and books, with the best massive, squishy sofas to relax on, a huge TV and a grand dining table. It was clean, and had nice bedding and quality furnishings and equipment - all chosen by someone with an artistic eye. The kitchen is well-appointed and has an array of handy cooking ingredients to use. We loved relaxing by the pool, watching the changing light on the volcanos and seeing the stars at night. It really was the ideal location as well - slap bang in the middle of the island, nothing is too far away. And finally, if you are a dog-lover, you are going to be in heaven as you will get to cuddle and play with the most adorable Portuguese water dog, Lenny. He stole our hearts immediately. We are certainly looking forward to a return visit when we can - thanks a lot Paul! The property was lovely and the owner (and his very friendly dog) were great. Some of it does need updating though. Also, the swimming pool - lovely as it was - is definitely not heated, and there is no barbecue. Both of which are mildly irritating when that is what you based your choice of holiday property on. The beds are perfect to be able to enjoy a truly memorable restful, relaxing and rejuvenating night's sleep. Located in the middle of the island allowed us to visit all points north, south east or west with ease as nowhere was more than 20 miles away. Proximity to the airport is a bonus and any noise is blocked out by Montana Blanca which at 2,000 feet stands between La Granja and the runway. We will definitely book again next year. Paul who is the owner, lives in the adjoining cottage. He is charming, helpful and seems to know all the answers to the many secrets of good food, good beaches and how to enjoy the huge contribution of the local legend Cesar Manrique who as an artist, architect, environmentalist and political activist has helped to shape Lanzarote. Follow his cultural trail and enjoy Manrique's insistence that every building on the island should be discreet, respectful and low-rise. Finally the real star at La Granja is Lenny, the gentle Portuguese Water dog who might want to join you for breakfast but only if invited! A wonderful rural finca set in about 3/4 a acre , carefully restored to keep the essence and feel of its age . It is huge inside with a loverly sitting room , dinning room and modern well equipped kitchen. Outside the pool area has views of two calderas ( mountains ) framing the distant sea view and the separate large patio area is sheltered by 5 mature eucalyptus trees giving welcome dappled shade in the heat of the day. 3 spacious en suite bedrooms with very comfy beds . Paul and his friendly dog Lenny were very welcoming and helped to make a very enjoyable holiday. Our only regret is we wished we had found this wonderful villa years ago and of course - we will be returning . 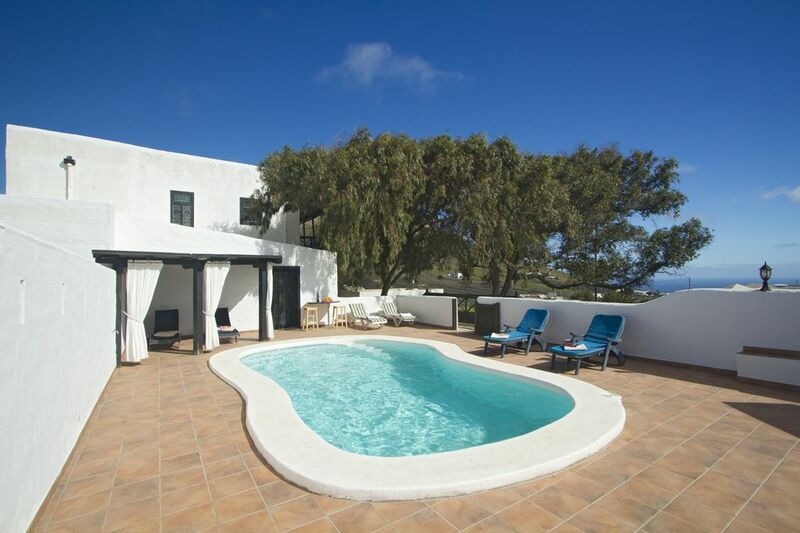 La Granja is a traditional Canarian farmhouse which has quietly looked over the village of Montana Blanca, towards the ocean, for more than 200 years. The house lies between Montana Guatisea and Montana Blanca with views of the sea to the West. To the East is the wine growing area of La Geria which adjoins the Timanfaya National Park. One of the best wineries on the island is within walking distance and is well worth a visit. Golf: Costa Teguise Golf - It is an 18-hole, par 72 par course which ranges in length from 4938 metres to 6,041 metres at its longest. Course facilities - the course benefits from an excellent clubhouse with a Pro-shop, Restaurant and Coffee Bar. A full range of equipment is available for hire from half and full sets of clubs through to Golf Buggies. The course has a resident pro and offers both private and group lessons. Puerto del Carmen Golf - It is an 18-hole, par 72 course with four par 3's, four par 5's and ten par 4's, with a total length of 6,133 metres. MAIN house - Price based on 6 people sharing for the week, if fewer than 6 coming please ask me for a price for the number attending. There will be an additional charge for items supplied locally .e.g. cot/high chair etc, if this is needed please ask when booking.